Drawn on Stone by J. D. Harding from a Sketch by S. Rayner. Samuel Rayner's vibrant sketch of South Parade, with its museums and Great Petrifying Well, was published as a lithograph in "Sketches of Derbyshire Scenery, Part 1", a book dating from the time when he was living in a house on Museum Parade (South Parade). The book was published in 1830 by J. Vallance of the Centre Museum, Matlock Bath and contained a series of lithographs from Mr. Rayner's sketches. The sketches were reproduced on stone by J. D. Harding, and the plates were then printed by Hullmandel. The artist would have been standing opposite the entrance to the Old Bath Hotel, above the Fish Pond Hotel (know as the Old Bath Tap at the time), to draw the scene. The Upper Towers, high up on the hillside above Matlock Bath on the Heights of Abraham, must have only just been built. In May 1831 John Vallance announced that he would "possess" Mr. Rayner's beautiful works and would exhibit them in the forthcoming season. He displayed several drawings in his museum that had been executed by Mr. Rayner on black marble tablets. So who were the people involved with the lithograph? Charles Joseph Hullmandel (1789-1850) became the finest lithographer in Britain. He also printed lithographs. In the 1840s he went into partnership with Joseph Fowell Walton, who continued the business for a time after Hullmandel's death. James Duffield Harding (1797-1863) was a landscape painter and lithographer who was born in Deptford who worked closely with Hullmandel and travelled with him to Italy. Samuel Rayner (1806-1879) was the head of a family of artists and lived on Museum (South) Parade for some years. The building with the big bay window in the middle of the parade had been Mr. Mawe's Royal Museum and next door was another Royal Museum, begun by Mr. Vallance in 1831; this eventually became Smith's Royal Museum. Perhaps emphasis in the sketch might have been given to the large bay window and the entrances of the Museums, as they seem to stand out on the Parade, because of Rayner's link to Matlock Bath. Although it is not known exactly when the association between Vallance and Rayner ended, the Rayner family didn't remain in Matlock Bath as Samuel moved his business to 17 Friar Gate, Derby in the 1830s and from there they went to London. 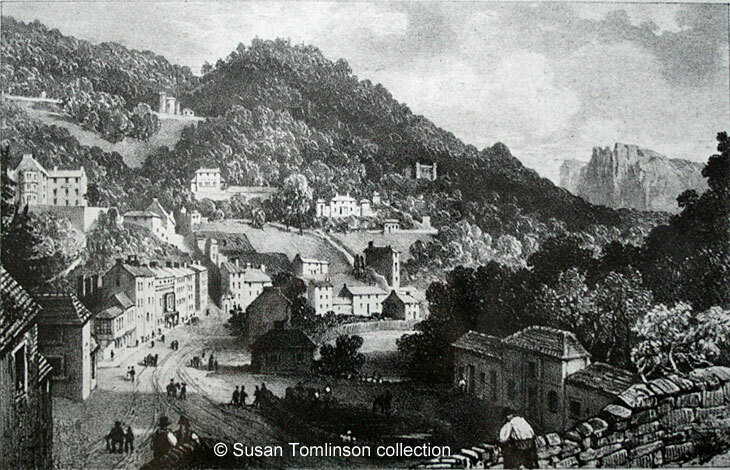 Lithograph of "Matlock Bath" from the collection of and © Susan Tomlinson. Information researched, wrtten by and © Ann Andrews. "The Derby Mercury", 8 June, 1831 (advertisement written May 1831). Rayner's other address in 1831 was 11 Blandford Street, Portman Square, London (same paper, but 12 Oct 1831). Oxford Dictionary of National Biography (an external link). "The Morning Post", 19 November, 1850. On the 15th inst., suddenly, at 51 Great Marlborough Street, Charles Joseph Hullmandel, Esq. In the 1851 census Harding was living Abercorn Place, St John's Wood, with his wife and son. His occupation was given as artist. See Biographies (R): Louisa Rayner. In the 1841 census Mrs. Ann Rayner was with the children in Friar Gate, though Samuel was not at home.